The 1.9% devaluation sends the Yuan to its weakest since April 2013. Asian currencies are getting hit hard today since the China announcement, for example US$ against Sing$ has hit a new recent high of 1.40 from a low of below 1.32 just a few months previous. That is a 6% move in just the last 3 months. Last year US$ ag Sing$ was trading at 1.24 - that is a 11% devaluation in the last 12 months. Chinese stocks are holding on to modest losses in the pre-open as, just as we have been warning, the PBOC weakens the Yuan fix by the most on record. As we first warned in March, and as became abundantly clear over the weekend when weaker than expected export data as well as the steepest decline in factory gate prices in six years underscored the extent to which the engine of global growth and trade has officially stalled, Beijing has no choice but to join the global currency wars, as the yuan's dollar peg will ultimately prove to be too painful going forward. The renminbi has appreciated on a REER basis by double digits over the past 12 months, weighing heavily on already depressed exports. With multiple policy rate cuts having proven to be largely ineffective at resurrecting the flagging economy, the PBoC, despite the notion that this represents a "one-off"move, has been left with little choice. The bottom line: the danger posed by the country's deepening economic slump now definitively outweighs the risk of accelerating capital outflows - especially after the latter moderated slightly in Q2. As we noted over the weekend, "one can repeat that the PBOC will have to lower rates again until one is blue in the face (even as out of control soaring pork prices make it virtually impossible for the local authorities to ease any more), the realty is that Chinese QE is now inevitable. Why? Because while the government is already clearly buying stocks thereby validating the "other" transmission mechanism, the only thing the PBOC still hasn't tried is to devalue the yuan. As global trade continues to disintegrate, and as a desperate China finally joins the global currency war, it will have no choice but to devalued next." 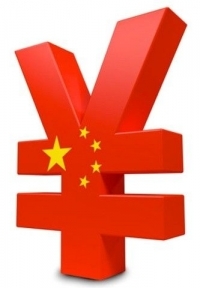 In the current deflationary environment the Chinese authorities simply can no longer tolerate the continued appreciation of their real exchange rate caused by the dollar link.